It’s hard to imagine that just a few hundred years ago the island off our coast was nothing but a long strip of sand, only occasionally visited by native americans that crossed the expansive bays in dugout canoes. These people were “discovered” by explorers in the early 1500’s and wiped out as a race by 1852. They lived and breathed the bays and waters along the ample coastline. Known as Karankawa, the early explorers and settlers had another name for them as well, “Water Walkers”. 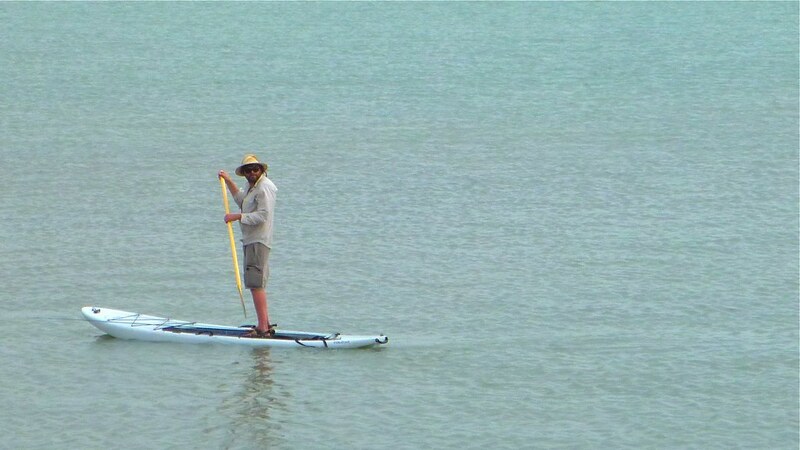 Paddling my board around the Laguna Madre, feeling like a modern-day “Water Walker” it was hard to imagine a simpler time when sand would be whipping off the dunes and through the sun drenched sky. I was here, surprisingly, with tens of thousands of others that were celebrating Holy Week (aka Easter). Cars were crammed like sardines on every exposed inch of gooey asphalt. Live shows at the local water park caused sonic booms to echo across the bay at 120 Beats Per Minute. Parachutes swam through the overhead sky. Tourist beckoned to me from the pier hoping to ask “What is that called? Is it hard?”. In the midst of all this i really only had one thought…fish. If you’ve ever had a rod in your hand, as i guess most of you reading this have, you know the feeling. Casting into the water HOPING to feel resistance and a tug manifested on the other end of the line. You focus so much on this potential moment that at some point the distance of time between you and that moment starts to converge though they may in fact never meet. At that time your truly in the moment, you are at “0”. Neither dwelling on the future (positive time) or the past (negative time). I experienced this sensation when i lost myself for what felt like a good while, (probably only really 10 seconds). The crowds slipped away and the constant barrage of noise melted into the din of the crashing waves. The bay bridge simply disappeared, ala David Copperfield, and suddenly i was back in time with nothing but the water and the sandy dunes bordering the horizon, the Karankawa spirit floating across the bay on the cusp of the breeze. It was bliss. The moment of zero. On the long drive home it occurred to me that this number was the connection between the moment, the amount of fish caught, and the holiday that had come to pass. That being a celebration of re-birth with the most appropriate of symbols, that being the egg, or the number i’ve come to find solace in, the mighty “0”. God i hope i catch some fish soon.